The following is an excerpt from “The Revolution Where You Live: Stories from the 12,000 Mile Journey Through a New America,” published by Berrett Koehler, 2017. Posted with permission. We live in a world in which chaos seems to be winning out: police shootings of unarmed black men and women, war abroad and in our streets, the devastating impacts of climate change, the hardships faced by millions of Americans struggling to feed their families and make ends meet. Yet Dr. King stated that we have a choice—we can choose community. But what does community mean in this moment in history? As a starting point, it means that we reimagine our relationships to one another and to the natural world. 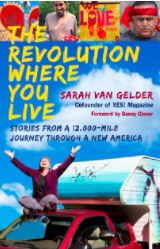 This book, written by Sarah van Gelder, tells the stories of people around the United States who are reimagining the world around them and, in doing so, creating new possibilities for community. Sarah spent nearly five months traveling 12,000 miles around the United States, learning how people are creating a revolution right where they live. She visited Native American reservations that—in spite of their historic social and economic struggles as stewards of the planet Earth—are blocking attempts by fossil fuel companies to mine coal and engage in fracking for oil and gas. Sarah visited Chicago, Detroit, Cincinnati, and small towns in Appalachia and New Mexico, learning from people working to create just and locally rooted economies. She visited leaders in Greensboro, North Carolina; Harrisonburg, Virginia; Ithaca, New York; and Moab, Utah, who are building bridges of justice and understanding between divided communities. When I travel the world as a UNICEF Goodwill ambassador, I see time and time again the essential role of communities. It is people working locally, joining together to create powerful movements of resistance and reimagining what’s possible that gives me hope. In the United States, it is in local communities that we see the impact of toxic pollution, poverty, and poor schools, which together create the world’s highest rates of incarceration. But it is also in communities that we see people working to protect and restore water quality, stepping up to create safe and liberating spaces for children to learn, and reaching out to the formerly incarcerated to welcome them home. It is in community that we can stop the environmental pollution that causes children in South Central Los Angeles to have a third of the lung capacity as children in Santa Monica. And it is in intergenerational communities that children can learn from their elders to master the tools needed to live intelligent, creative, and involved lives. Even the global movement to prevent climate disruption and resist projects like the KXL pipeline are most powerful when they are based in the communities most affected. Paul Robeson once said that each generation defines its own history. We, too, will be defined by the history we make. Like Robeson, we live in a time of crisis. It is a time of racial injustice, poverty, war, and irreparable damage done to nature. It is a time of growing divides between the wealthy and the poor, and a time when the working class struggles to hold on to what they have. Those crises test who we are as people. Those are the words of Dr. King. It is in reimagining our relationships to each other and to nature that we make the sort of change Dr. King advocated, a change centered in our souls. This book tells the stories of people stepping up to make soul-centered changes. Often these local actions are not dramatic, and no one has all the answers. But each of us has something to offer, and in reading about the people Sarah interviewed and in learning of the changes they are bringing about, it becomes clearer that the chaos of the early twenty-first century is just part of the story. The community Dr. King spoke of is also a possibility for the human future, and in neighborhoods, reservations, small towns, and struggling cities, people are working every day to make that possibility a reality. That is a deeply hopeful sign that the beloved community Dr. King spoke of may, after all, be the legacy we leave our children.